Laparoscopy-Assisted Surgery for Recto-sigmoid Tumor: A Comparison of the Medial Approach and Lateral Approach. Introduction: After spreading application of the technique, mobilization either by medial and lateral approach has been performed. However, the comparison of both techniques has not yet been well discussed. 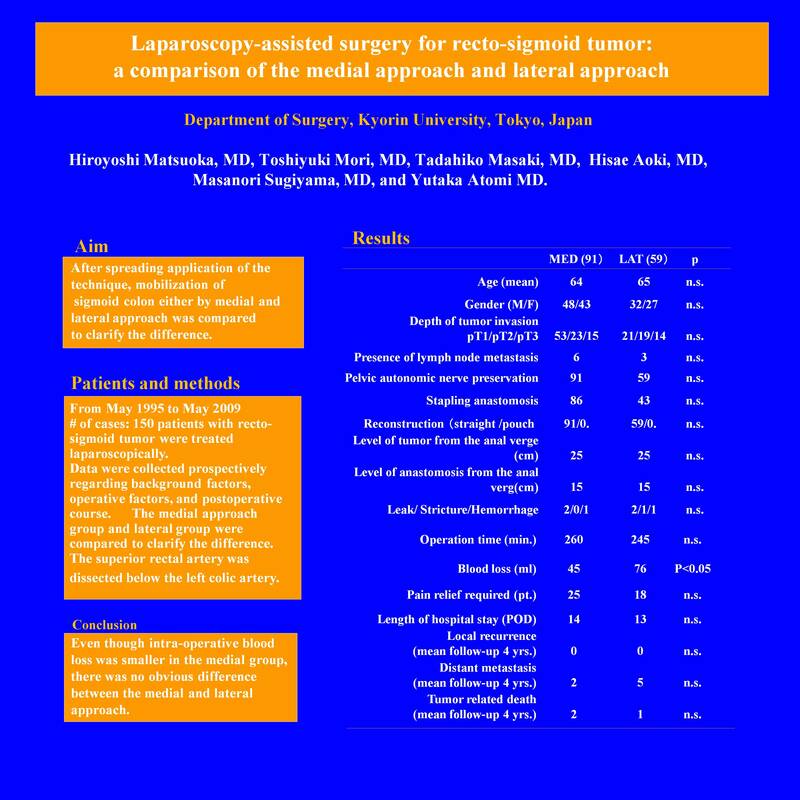 Methods: From May 1995 to May 2009, 150 patients with recto-sigmoid tumor were treated laparoscopically. Data were collected prospectively regarding background factors, operative factors, and postoperative course. The medial approach group and lateral group were compared to clarify the difference. The superior rectal artery was dissected below the left colic artery bifurcation. Results: In 150 patients, the medial approach was performed in 91 patients. Remaining 59 patients had lateral approach. Regarding background, there was no significant difference in terms of age, gender, tumor stage. Operative technique was similar between the groups in terms of dissection area, nerve sparing. Intraoperative organ injury was no seen in the both groups. Intra-operative blood loss was significantly higher in the lateral group. However, no one had blood transfusion. There was no difference in the operative time. Complications such as anastomotic leak, and stricture did not show statistical difference. Conclusions: Even though intra-operative blood loss was smaller in the medial group, there was no obvious difference between the medial and lateral approach.